The Queen B also had a fantastic year. She was the face of Marc Jacobs Spring 2008 campaign at the beginning of the year and towards the end she was seen as a respected designer in her own right. She landed many magazine covers this year, including the coveted UK Vogue in April and Harper's Bazaar. Victoria had a birthday party in April which was attended by Eva Longoria, Kate Beckinsale, Sean "Diddy" Combs, Sir Elton John, Usher, Gwen Stefani, Gavin Rossdale, Tom Cruise, Katie Holmes and Heidi Klum. Victoria on occasion dressed down on a few times, which is something we had not see often before. We saw Victoria purchase her now favourite Chanel bag from Resurrection back in April. Victoria worked hard to promote her dVb jeans collection in many stores in the UK, US and Canada and many of you went along to meet her. In September Victoria shocked us all with a new hair cut. It took some of us - me - a while to like it. She also launched her own dress collection this same month, which when it went on sale in December was a HUGE success and sold out everywhere. 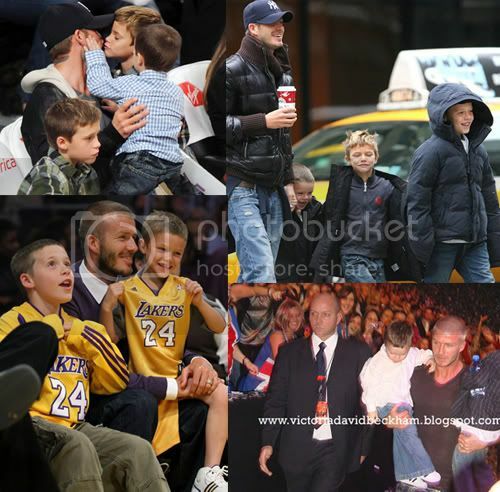 David Beckham had a GREAT year. 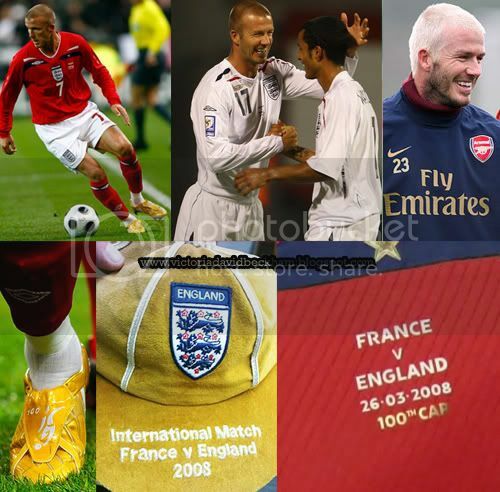 He returned to the England squad back in March and also finally achieved his 100 England cap, we could not have been more proud. David gave back by visiting leukemia patients at Xinhua Hospital in Shanghai and becoming a UNICEF ambassador and visiting Sierra Leone. David became a HUGE fan of the Lakers, and his boys did too. In June David gave us part 2 of his Armani campaign, much to our delight. In August David kick started the 2012 London Olympic games with Leona Lewis. I got very close to David Beckham this year at the Spice Girls concert, a memory I will keep forever. Towards the end of the year David joined AC Milan on loan. Most of us are hoping it will become a permanent move. After 9 years of marriage, the Beckham's are still going strong. They became the Hollywood couple after only being in LA for a year. The biggest occasion was in May the couple arrived at the Costume Institute Gala, but they also walked the red carpet at the ESPY Awards. Separately they are fantastic, together they are amazing. A lot of you have been complaining about Victoria Beckham's style recently. Some have even used the word 'Boring'. While I disagree that her style is boring, I will say that I do miss the more colourful side of her wardrobe. I think it is great that she looks so fantastic in her own collection, but I would love to see her wear other designers too. 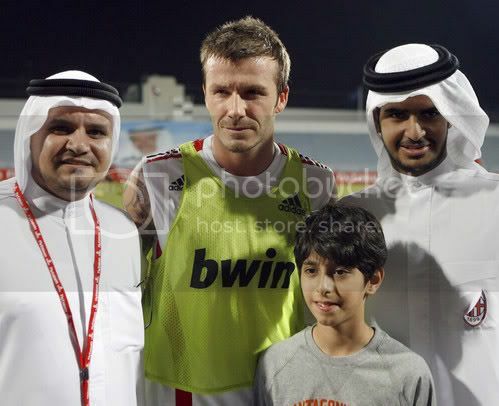 Here is David Beckham on the second day of an AC Milan winter training camp in Dubai. It is hard to see, but David is wearing specially-designed boots bearing both the Milan club crest and the English national flag. 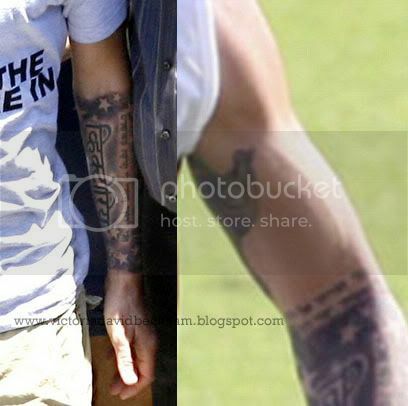 The Hebrew tattoo sits under his bicep while another design, possibly a cherub, can be seen inside his upper arm. You may remember that David first got the right arm tattooed back in January this year. It has been revealed today by the Sunday Mirror that contrary to reports, Victoria actually helped her husband not only to choose the words, but the design of the new tattoo's. David Beckham unveiled his new tattoo whilst training in Dubai today. 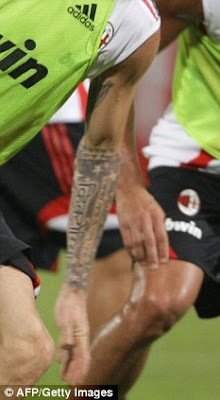 The latest design can be seen tucked on the inside of Beckham's already heavily-inked left arm. Many outlets are reporting that Victoria is furious with the new tattoo, but I don't see why. 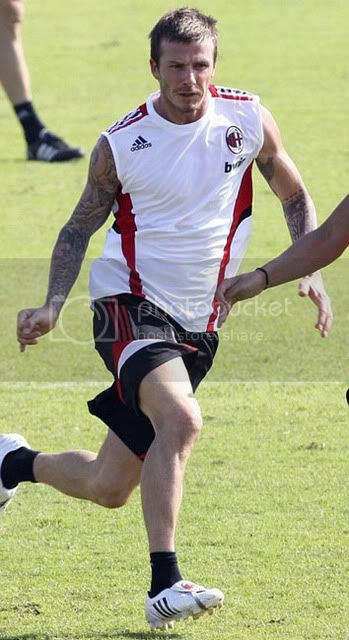 A very hot and deliciously sweaty David Beckham trained for the first time with his new AC Milan team mates in Dubai this afternoon. The football giants arrived yesterday to start their winter training camp in the Gulf emirate. They will complete their training camp with a Dubai Football Challenge match against German team Hamburg. It has been reported that AC Milan arrived in Dubai under armed guard. It is believed the security is second only to that used to protect George W Bush in his trip to the United Arab Emirates last year. David Beckham Gets A New Tattoo? Victoria Beckham Allergic To Pasta? Can Anyone Else See The Resemblance?